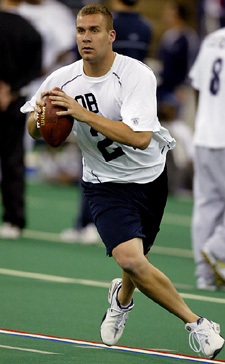 The 2012 NFL Combine begins next week, February 22nd through the 28th. More than 300 top prospects for the upcoming NFL Draft will be invited to participate at Lucas Oil Stadium in Indianapolis. “There are plenty of hesitations within the league when it comes to expecting early results from a highly rated junior quarterback, and the track record of such picks is less than comforting. Yes, Ben Roethlisberger was the exception to the rule in 2004. But for every Big Ben — and there’s only one — there have been an Alex Smith, a Tim Couch, a Ryan Leaf, a Heath Shuler or an Andre Ware.” — Don Banks, from his column on the NFL Combine, Sports Illustrated. About six weeks ago, Roethlisberger moved to Newport Beach, Calif., and began a rigorous workout regimen. He trains six days a week, three times a day, working with a quarterback coach, a strength coach and a conditioning coach. The 6-5, 245-pounder possesses the qualities teams want in a quarterback: size, arm strength, accuracy, some mobility, smarts. Roethlisberger and Manning are at the six-day NFL combine in Indianapolis, where prospects show off their physical and mental skills. It also gives teams a chance to interview and get to know the players. It might determine where Roethlisberger and Manning go in the draft. San Diego, Oakland and Arizona pick 1-2-3 in the draft. All could use a quarterback. The Chargers aren’t sold on Drew Brees. Rich Gannon is at the end of the road. Arizona released Jeff Blake, and no one is sure Josh McCown is the answer. 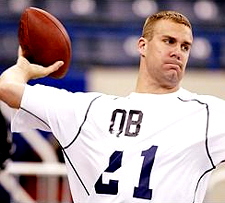 “In 2004, Big Ben entered the draft as a junior and did not have the benefit of postseason All Star Games. His draft grade was heavily reliant on the combine and he did not perform well. He was inaccurate with his passes throughout his workout and as a result became the third quarterback chosen in the ’04 draft.” — Sports Illustrated, “Classic NFL Combine Stories” posted February 20, 2009. It’s remarkable how far he has come in such a short time. Until his senior year in high school, he was a receiver. Yet, he was talented enough to take the Mid-American Conference by storm. That might not seem like a ringing endorsement on the surface, but remember that the last two MAC quarterbacks to do that were Chad Pennington and Byron Leftwich, both of whom appear to have bright NFL futures. Roethlisberger, who declared himself eligible for the NFL draft after his junior year, has a good pro arm, is more athletic than Eli Manning and Philip Rivers and sees the field well. Scouts generally believe he has the highest upside of this year’s QB crop, but also represents the greatest risk because of his limited experience. Ben Roethlisberger has everything you look for in a franchise quarterback. He’s got the big arm, but he also has excellent accuracy (69.1%) and nice touch. He is a pure pocket passer with excellent size and he moves around in the pocket well. He also has great escapability, often making the first defender miss. He also throws with incredible accuracy on the run… especially for a player his size. There’s not much to dislike about Roethlisberger’s game. The only knock on him is that he played in the MAC, but with guys like Pennington and Leftwich coming out of the conference in recent years, I doubt his draft status will be adversely affected. Big-armed pocket passer with the ability to grow into a franchise quarterback. Sets up to deliver the ball with solid footwork, stands strong in the pocket and smart. Sells the ball fakes, scans the field and consistently finds the open pass-catcher. Senses the rush yet buys as much time as possible, waiting for the last second before releasing the ball. Rarely panics, in complete control of the offense and a true leader behind center. Natural looking off the safety, throws with a fluid over delivery and possesses a big arm. Drives deep passes downfield, puts zip on the intermediate routes as well as velocity on all his throws. Throws tight spirals and beautifully arches deep throws. Leads receivers over the middle and very accurate. Gets outside tackle and accurate passing on the move. Does not make poor decisions and always working to make positive plays. A pocket passer with marginal mobility and cannot escape the rush. Must improve his downfield accuracy as well as the placement of the outs. Majority of snaps are taken out of the shotgun. We’ll look back at Ben’s Pro Day Workout next month.